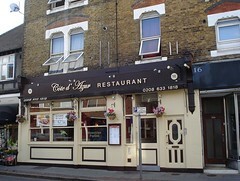 French and Mauritian fusion restaurant in Croydon, in the premises formerly occupied by Le Cassoulet. Note: As of February 2019 there's a notice in the window photo dated 16 January stating that the restaurant is closed "due to family matters". The situation is the same as of late March. It isn't clear whether this closure is temporary or permanent. The floorboards are bare, tablecloths and napkins are thick white linen, and recessed ceiling spotlights are augmented by tulip-shaped lamps on the walls. Much of the seating is on banquettes — a long one against one wall and two little booth-like curved sections seating half a dozen each. Many of the tables are very close together, making it quite tricky for the person on the banquette side to get out when both neighbouring tables are occupied, and also hard to avoid overhearing other people's conversations. Kake and bob visited on a Friday evening in March 2014. We hadn't booked, and when we arrived around 6:45pm we were told we could have a table as long as we gave it back by 8:15pm. This was initially a little surprising, as the place was fairly empty, but it filled up substantially during our visit. Some of the other customers appeared to be regulars. Music was playing quietly, possibly French or Mauritian. Tap water came with ice and unsolicited lemon. A basket of decent enough bread was placed on the table (and didn't appear on the bill). Kake's starter of Mauritian crab soup (£5) photo was great, with a lovely deep flavour in the broth, and plenty of white and brown crab meat served in the shell. bob had the crab samosa (£3) photo; we asked for this without the sour cream, due to a dairy intolerance, but it appeared on the plate anyway. Kake's main course of prawns rougail (£12) photo contained large and competently-cooked prawns, with the heads and part of the shell left on. This came with a mound of white rice topped with microgreens, some rather mushy potatoes, and long strips of pickled cucumber. bob's Mauritian chicken curry (£10) photo consisted of large pieces of chicken in a reasonably spicy curried sauce with peas and okra (the peas were overcooked to Kake's taste.) It was accompanied by the same rice, potatoes, and microgreens, plus a crispy bhaji which could possibly have done with a little more cooking in the middle. A 10% service charge was added to our bill photo. Kake's verdict: I've already been back once purely for the crab soup. I'd come back again. Last visited by Kake, Ewan, et al., June 2014. Opening hours taken from sign outside, October 2018. Last edited 2019-03-26 14:26:04 (version 7; diff). List all versions. Page last edited 2019-03-26 14:26:04 (version 7).